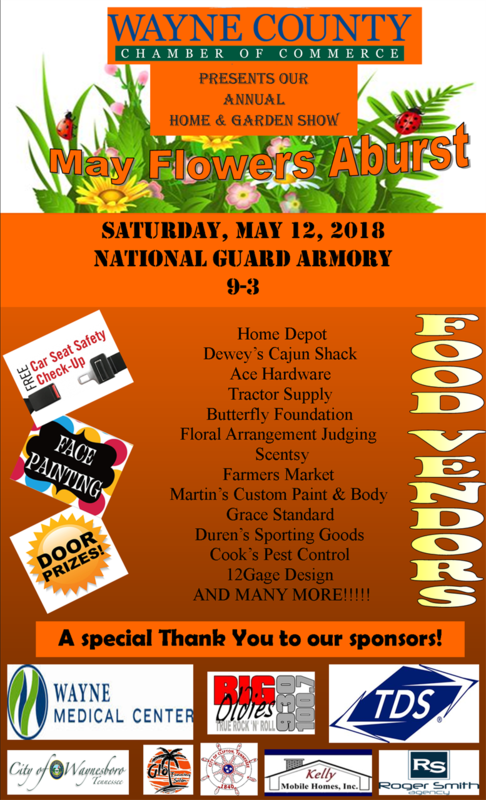 Wayne County Chamber of Commerce - 4th Annual Home & Garden Show: "May Flowers A Burst"
4th Annual Home & Garden Show: "May Flowers A Burst"
The Wayne County Chamber of Commerce will host its 4th Annual Home & Garden show. Themed "May Flowers Aburst",the 2018 show will feature an array of home & garden products, vendors and exhibitors. Whether you have a DIY project or need a contractor or tools and equipment to get started, you'll find it at our show! Beginning at 9am at the National Guard Armory on US 64 Bypass in Waynesboro, with vendor set up beginning at 6am. Area representatives will have their products on display and booth services are available both inside and outside the event. Free 10x10 space for Wayne County Chamber Members. $50 booth fee for non-members.